Brainwashed - Bill Orcutt, "Bill Orcutt"
Bill Orcutt–his first solo electric studio LP—shocks with its space and sensitivity. On this eponymous record, Orcutt mines the expansiveness and sustain possible on the electric guitar, letting notes spin out and decay at the edge of feedback. His pachinko-parlor pacing, marked by unraveling clockspring accelerandos crashing into unexpectedly suspended tones, is still in evidence. But here, his developing melodicism maps a near-contemplative mental realm, orbiting St. Joan-era Loren Connors more than the cascading treble clatter of his duo LPs with Chris Corsano and others. From the first notes of Ornette Coleman’s "Lonely Woman," there's a lucidity and slow-burning lyricism that make Orcutt's plunges into barbed-wire fingerpicking all the more striking. While no one’s about to mistake Orcutt for Jim Hall, you could probably play this for your jazzbo friends (should you be unlucky enough to have them) without raising any eyebrows. Orcutt's track selection mirrors his obsession with American popular song in its most banal manifestations, as radically reimagined via acoustic guitar on a variety of releases, including 2013's exhaustive Twenty Five Songs 7" box set, and the Mego LP A History of Every One. Many of the songs from those two releases are here–but stretched into new arrangements that explore the upper regions of the guitar neck (hitherto unexplorable on his shakily-intonated acoustic Kay), and lighting up new corners of each arrangement with a sensitivity born from years of reinterpretation. The result is a languid, freeform drift through Orcutt's internal cosmos into galaxies unknown to their original interpreters–and occasionally, Orcutt himself. Most striking is "White Christmas," its careening low-register melodies crashing into complex chords that transcend Orcutt's primitive four-string fretboard. Orcutt's original compositions are equally striking. One of them—"The World Without Me"—is unique to this LP, and notable for its trebly flurry of Clapton-esque 12th-fret drizzle. "O Platitudes!" by contrast, spins ever-faster in the cadence of a hand-cranked music box, before grinding to a near halt, its higher-key electricity standing in for the moaning vocalizations on Orcutt's acoustic rendition as heard on his 2014 VDSQ LP. 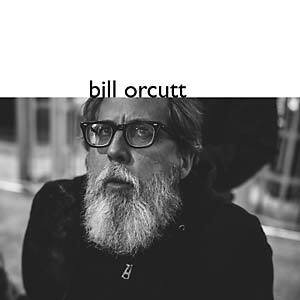 With its deep-space beauty, harmonic complexity, and dark dissonance, Bill Orcutt is a stunning landmark in Orcutt’s form-destroying trajectory.